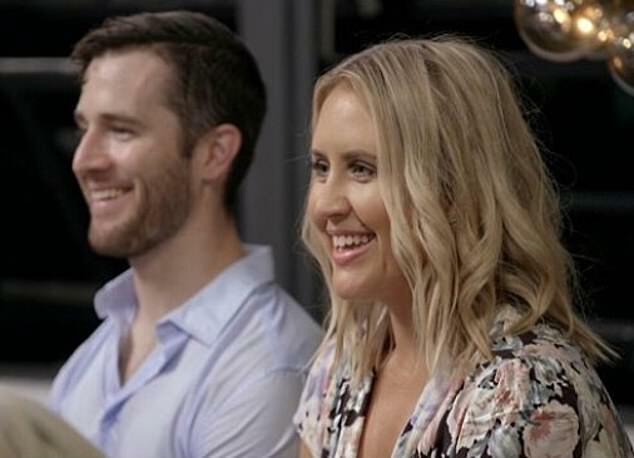 Married At First Sight’s Lauren Huntriss has claimed she received hardly any screen time during the two-part finale as ‘punishment’ for publicly criticising the show. 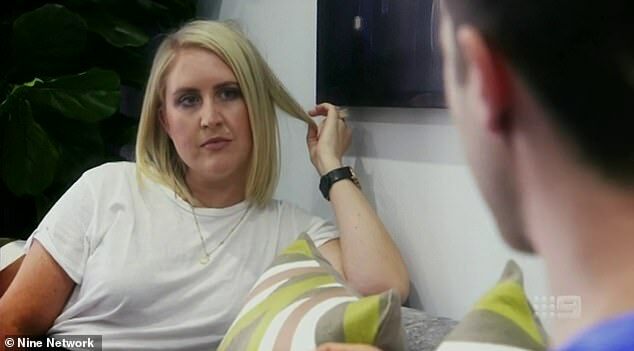 The 32-year-old, who was paired with ‘ex-virgin’ Matthew Bennett, only appeared for a few seconds in background and reaction shots on Monday’s episode. In a since-deleted Instagram comment, Lauren alleged that her mysterious absence was the direct result of her ‘p**sing off’ MAFS’ executive producer Tara McWilliams. She wrote: ‘You know you’ve p**sed MAFS off when you get two seconds [of] screen time… Love you, Tara’. Tara, who has previously been described as ‘one of the most powerful women in Australian television’, has been criticised by other MAFS participants in the past. Last year, she was targeted by Dean Wells, who accused her of ‘forcing’ him to make inflammatory comments at the boys’ night because things were ‘too boring for [her]’. He subsequently edited his on Instagram post, removing any mention of Tara. Daily Mail Australia has contacted Channel Nine for comment. 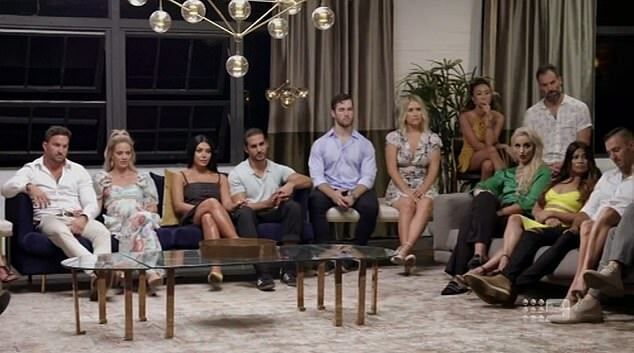 Lauren has publicly criticised MAFS producers, and is understood to have broken her contract with Channel Nine and Endemol Shine Australia by doing so. During an unauthorised interview with The Kyle and Jackie O Show in February, Lauren said she ‘deserved’ to tell her story despite efforts to silence her. She later said it was irresponsible for producers to put certain people on television because they weren’t mentally prepared for it. Lauren had previously claimed on Facebook that she was pressured into delivering certain ‘lines’ for producers. In one controversial scene on MAFS, she told Matthew she ‘used to be a lesbian’. 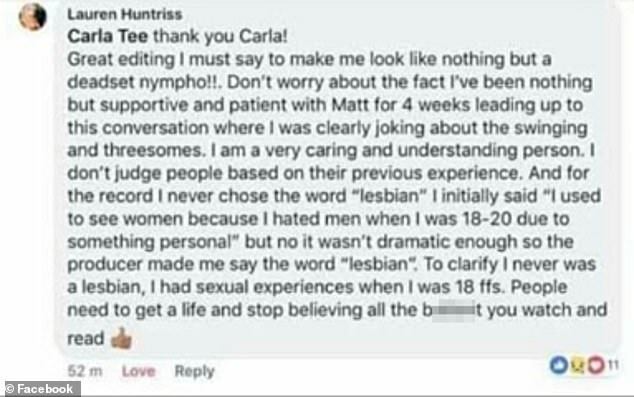 But according to Lauren, she was pressured into saying this because her previous admission (‘I used to see women’) apparently ‘wasn’t dramatic enough’. Speaking on Kyle and Jackie O afterwards, she said: ‘[The producers] will say to you, “We’ll keep you here all day until you say what we want you to say”‘. Last month, Lauren ruffled feathers yet again when she appeared to spoil the ending by revealing in an Instagram comment that ‘only one couple’ stayed together after the experiment. ‘[It’s] all for ratings sadly. They mismatched all of us except for one couple,’ she wrote, seemingly referring to the loved-up Jules Robinson and Cameron Merchant.